The section reproduced here is from my page about The History of the Borgel Watch. I have updated this section because the following quite amazing story came in from a fellow Borgel collector. I have added to the main article but I also wanted to highlight it here. You mention how you carried out an experiment into Borgel's water resistance. Over the week-end I carried out an unintentional experiment. I left my latest Borgel (a Longines) in the pocket of my jeans when I washed them! Imagine my horror when I noticed a lump in the pocket when I took the jeans off the line and it was not my customary soggy tissue but the Borgel. When I opened it there was not a drop of water, the inside was bone dry. Who needs Rolex Oysters when you have a Borgel. Yours Thomas, 7 June 2016. An unsolicited and amazing demonstration of the waterproof capability of a Borgel case in good condition. How Waterproof is a Borgel Screw Case? When I first started collecting Borgel watches I read statements that the Borgel screw case was not very waterproof; that it didn't have a waterproof crown, and that the pin-set was not waterproof. At first I went along with this view, but as time went on I started to question it more and more. I now think that Borgel screw cases were much better sealed than many people appreciate today and were in fact waterproof to the standard understood at the time. François Borgel advertised his screw watch case as "imperméable", which strictly means "not allowing fluid to pass through", and so it is evident that he considered his screw case to be waterproof - and this claim was not qualified in any way, or limited to the front bezel where the movement was screwed in. Borgel and the people who worked with him were skilled craftsmen and inventive engineers. Although today we are surrounded by modern technical marvels that Borgel and his contemporaries would be amazed by, the laws of physics have changed over the last one hundred years, and people haven't become any more intelligent, so I think it would be arrogant to simply dismiss the Borgel screw case as "not very waterproof" without considering it properly. A note on terminology: we all know that standards of advertising have changed since 1891 and that the use of terms such as imperméable or waterproof has been tightened up since then, so that even the Omega Seamaster that I am wearing as I write this is called "water resistant to 600m/2000ft" rather than "waterproof". But what I mean by "waterproof" in the context of a hundred year old Borgel screw case watch is what I think Borgel himself meant, it was sealed so that it wouldn't let in water during everyday use. And that is what I mean here. It is evident that by eliminating the back case joint (and here I mean joint in terms of a junction between two parts, not the case maker's term for a hinge) in his 1891 patent design, Borgel had produced a watch case that was already better sealed than the typical "jointed" cases of the time, with their hinged and snap-closed case backs. The screw assembly of the case could also produce a tighter joint where the bezel meets the case although today many of these are slack because the case has been unscrewed may times over the years. 1. Bezel to case joint. The need for the movement to stop rotating when the 12 on the dial is exactly at the 12 o’clock position means that careful adjustment is necessary to get the bezel to screw down tightly onto the case. This is easily achieved by adjusting the height of the threaded carrier ring, a slight reduction in height makes a tighter seal. I haven't made a separate drawing to show this joint but if you want to see a cross section it is the joint where the red bezel meets the green case in the drawing in the section entitled The Borgel Case in Detail. 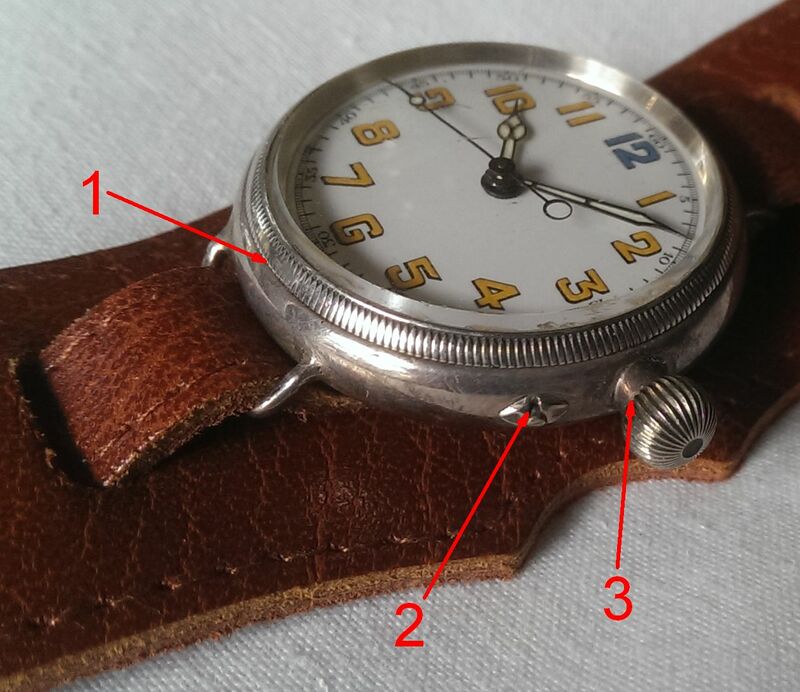 The tightness of the bezel to case joint relaxes due to wear in the screw threads over the years, and on some Borgel watches the bezel is now positively quite loose. This is made worse because most Borgel cases are gold or silver and their threads are more prone to wear because they are relatively soft materials. This gives a misleading impression about how good the seal would have been when the new case left the Borgel factory in Geneva. Borgel cases with unworn threads screw up smoothly and the joint between the bezel and the case is tight. All new, factory fresh, Borgel screw cases would have been tight like this. 2. Hand-set push-pin. 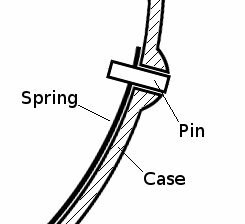 The push-pin for the pin set hand set mechanism is held in place by a flat piece of spring steel that wraps most of the way around inside the case as shown in the figure. The flat piece of spring steel is wider than the push pin that is welded into it. The flat spring covers the inside of the hole though the case for the pin. I don't think this happened by accident, I believe that the spring steel strip was carefully designed to close the hole and prevent entry of dust and moisture. Obviously this joint is open when the hands are being set, but that only happens relatively infrequently and the user can choose when to do it. The same consideration applies to a screw down crown, which must be unscrewed in order to set the hands. In both cases the owner is unlikely to do it when water might get into the watch. 3. Crown to pendant or stem tube joint. When the movement is screwed fully home and the crown released it is pulled onto the end of the stem tube by the spring that keeps the outer part of the split stem engaged with the part in the movement. This is shown in the figure "Borgel crown detail". 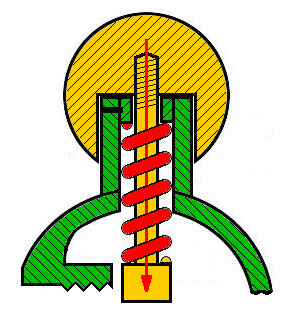 I have made the spring red and added a red arrow showing how the spring pulls the yellow crown down onto the end of the green pendant, making quite a tight joint between the crown and the pendant or stem tube. The Borgel crown is similar in this respect to a screw down crown where the screw thread keeps the crown tight against the end of the stem tube. In the Borgel screw case the spring holds the crown against the end of the stem tube. This is not described in Borgel’s patent but I think it was an intentional design feature that was included as an improvement to the patented design. Obviously the crown to pendant joint is opened if the crown is pulled away from the watch, but this only happens if the movement is being removed from the case. These considerations made me realize that the Borgel screw case was carefully designed and does provide good resistance to the ingress of dust and water in all three areas; the bezel, crown, and push-pin joints. And in fact, this is evidenced by the very good state of preservation of many movements in Borgel cases. Obviously all three joints are metal-to-metal joints with no gaskets. But there is nothing wrong with a metal to metal joint if the mating faces are smooth; in fact in many respects you are better off if you don't have to reply on a gasket, and there were no good gasket materials available in Borgel's day, it was a choice of leather or string. Natural rubber was too prone to perishing and modern "O" rings made of synthetic material only came along much later in the twentieth century. Which all still leaves open the question "just how waterproof is a Borgel screw case?" To try to answer this question I decided to try an experiment. I took one of my Borgel watches, not one of my best ones for fairly obvious reasons, and removed the movement. This particular watch has suffered from someone trying to lever the movement out, so there are a few gouges around the bezel, and the crown and push-pin are well worn. 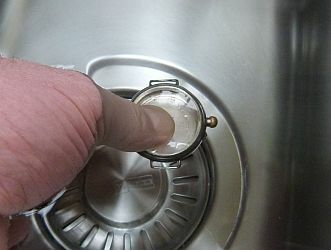 Even though it was not in “factory fresh” condition, when I submersed it in water in a sink for a few minutes as shown in the picture — you can see the water level at the top of my thumb — and it did not let in water, either through the bezel joint, the crown or the push pin. I think this vindicates the Borgel screw case as being designed and manufactured to be waterproof. Of course I’m not about to go deep sea diving in any of my Borgel screw case watches, but it does show that the Borgel screw case, even a rather battered one like the one I tested, is much more “waterproof” than many people today give it credit for. I am sure that a newly made case leaving the factory would be quite “tight”, and without doubt very much superior in this regard to the standard jointed watch cases of the time. A practical demonstration of the impermeability of the Borgel screw case is given in an article from "The Tatler" magazine of March 1915 that is reproduced here. It describes a Borgel cased watch spending several days in the Modder river during the South African War, the second Boer War (1899 - 1902). The watch was rescued from the river and after being used by the original owner's brother for many years on the West Coast of Africa it was returned to the Goldsmiths and Silversmiths Company Ltd. as an interesting curio proving the excellence of their watches. 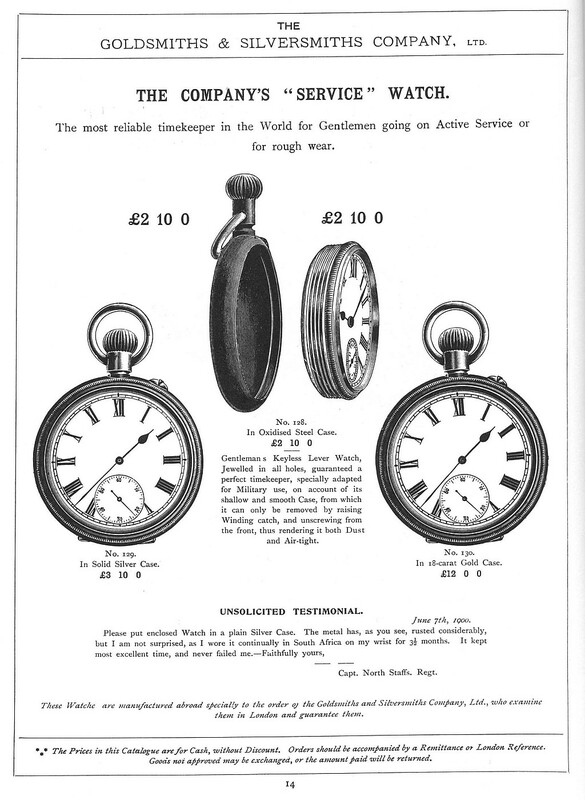 It was exhibited at their showrooms and, although the case could not be opened, it was still a reliable timekeeper in 1915! The sharp eyed might notice that the article does not mention that the watch in question has a Borgel case. It is described as a "Service Watch" with an oxydised steel case that was purchased from the Goldsmiths and Silversmiths Company Ltd. for £2 10s. The advert below from the Goldsmiths and Silversmiths Company Ltd.'s catalogue of 1901. 1901 Goldsmiths Advert: click to enlarge. The advert is for "The Company's "Service" Watch,". It was described as "The most reliable timekeeper in the World for Gentlemen going on Active Service or for rough wear." The watches have Borgel cases, the watch in the centre clearly shows this. The page shows that the same watch is available in oxydised steel, silver or 18 carat gold. The silver and gold cased watches are illustrated with hinges at the bottom of the case but this was an error on the part of the illustrator. The "UNSOLICITED TESTIMONIAL" at the bottom of the advert, dated June 7th 1900, states "Please put enclosed Watch in a plain Silver Case. The metal has, as you can see, rusted considerably, but I am not surprised, as I wore it continually in South Africa on my wrist for 3½ months. It kept most excellent time, and never failed me. Faithfully yours, Capt. North Staffs. Regt.". The Prince of Wales' North Staffordshire Regiment was formed in 1881 and served all over the Empire. The 2nd Battalion was mobilised to South Africa in 1899 and remained there until 1902. The captain's watch was cased in the oxidised steel case shown in the middle picture and worn in a leather wristlet. 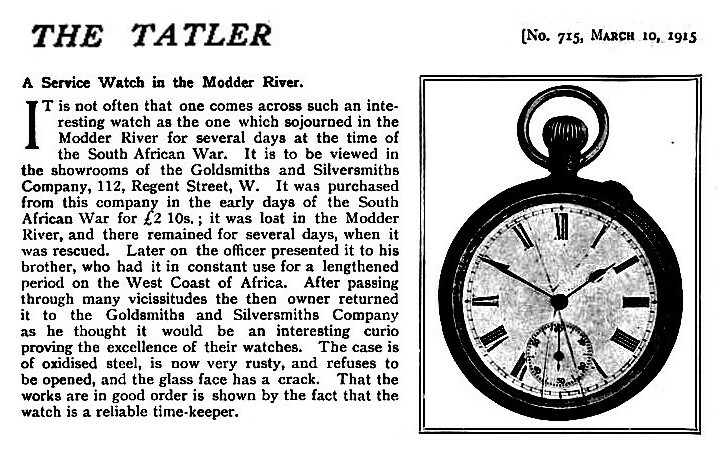 This was exactly the same model as the watch in the Modder river. The oxidised finish was intended to prevent rust, but this was not very successful in damp conditions. At £2 10 shillings, the price quoted in the Tatler article, the steel case was considerably cheaper than a silver case, which increased the price of the same watch to three pounds ten shillings, or the ultimate 18 carat gold case at twelve pounds. The process of oxidising the steel is described at Black steel watch cases. The Borgel case was waterproof — to the standard understood at the time; it wouldn't let in water during everyday use. It must be remembered that people didn't expect to go swimming wearing their watches, or rather carrying them in a pocket in their bathing costume since pocket watches ruled the day when François Borgel was designing his screw case. Recreational diving didn't come along until Commander Yves le Prieur invented the Scuba set in 1925, and Omega launched the first qualified "dive" watch in 1932 with the Omega Marine. The Rolex Oyster is often regarded as the first waterproof wristwatch, although there were many other waterproof watches, and even waterproof wistwatches, before the Rolex Oyster, as I relate on my page about waterproof watches. The Rolex Oyster had a better sealed crown than the Borgel screw case, and there was no pin-set for setting the hands, but at first the Oyster case was screwed together by hand just like the Borgel case, using milling on the bezel and case back identical to that seen on Borgel cases. It wasn't until 1931 that the "Easy Oyster opener" was introduced to allow these cases to be screwed together more tightly than could be achieved by hand, and later still that slots or flats for keys were introduced — most famously by Taubert & Fils who took over the Borgel company in 1924. Hans Wilsdorf didn't claim the Rolex Oyster was suitable for diving; it probably simply didn't occur to him, leaving the field open to Omega. For use in the dusty, damp, and often very wet, conditions of the Great War front line trenches in France and Flanders the Borgel screw case was well up to the job. This is why so many of the adverts during the war for "Service" or "Military" wristwatches, aimed at Army officers getting their kit together to go to the Western front, are for wristwatches with Borgel cases.